Opal includes a comprehensive software infrastructure facilitating data harmonization as well as seamless and secure data-sharing amongst Biobanks. Run distributed queries on harmonized data sets. Each Biobank controls access rights to data in Opal. Consistent data access across Opal servers. Real-time distributed statistical analysis through DataSHIELD method. Opal is strongly integrated with Mica, a generic web portal for Biobank consortia. Through the Mica web interface, authenticated researchers can perform distributed queries on the content of each individual Biobank data collection hosted by Opal. Moreover, Opal implements the DataSHIELD method which enables individual-level data analysis across multiple Opal instances. The Biobank Secured Database Repository is where the Biobank data is stored. Ideally it is not connected to any network and therefore data are imported in Opal using files. 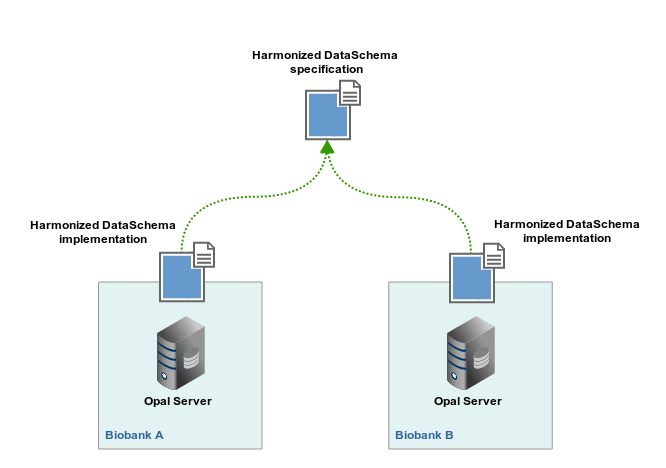 The Biobank External Network is a private network that hosts the Opal application and a database (running on the same server or on two different servers). The Opal server is hosted in a network that is protected by a firewall which only allows connections using encrypted (HTTPS) protocol through a specific port. Connections can also be restricted to specific remote clients. Opal application itself requires user authentication. Data hosted by Opal are subject to authorization (authenticated users can only see authorized data). Data are extracted from Biobank database as CSV files. These files are then imported in Opal database through the Opal application. There is no direct link between Opal and the Biobank Data Repository. Processing algorithms are then developed to derive study-specific variables into DataSchema format variables. Mica is a web portal which aims at disseminating summary data from consortium members once it has been harmonized. 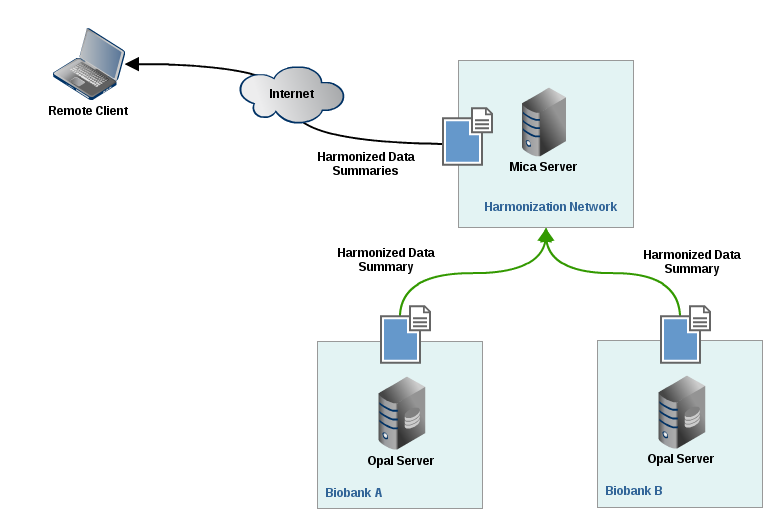 A Mica server will connect and authenticate itself against each of the Biobanks Opal servers holding the harmonized datasets. In return Mica server will display in its web interface data summaries of harmonized variables (count, min/max, mean, stdv etc.) to the remote user. Individual-level data are never extracted from Opal servers (data aggregations are computed in Opal). DataSHIELD stands for Data Aggregation Through Anonymous Summary-statistics from Harmonized Individual-levEL Databases. Some research projects demand very large sample size for detecting interactions. Such projects usually require pooling individual-level data from several studies to obtain this sample size. Important ethico-legal constraints often prevent or impede the pooling of individual level data. DataSHIELD is a method by which an analysis of individual-level data from several sources can be done without actually pooling the data from these sources together. The process is described in a paper published in IJE. Through Mica web interface, distributed DataSHIELD queries can be run on any harmonized data sets hosted on Opal.